The International Labour Conference (ILC) is a yearly gathering of governments, employers and worker representatives from across the world, organized by the International Labour Organization in Geneva. This year, the Vision Zero campaign drew a lot attention at one of the stands. The Vision Zero campaign was developed by the International Social Security Association (ISSA), which has occupational safety and health as one of its working areas. 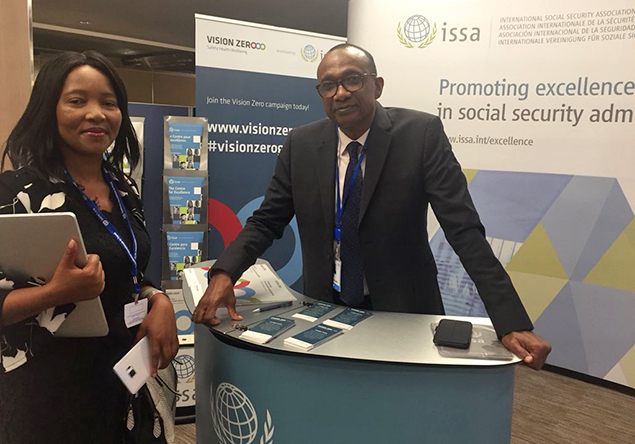 The ISSA again was created by, and functions under the auspices of the ILO, so it is only natural for the ISSA to have a strong presence at the ILC. On this year’s stand, Vision Zero was one of the key talking points. The campaign’s focus on health, safety and wellbeing at work is a win-win-win formula for governments, employers and workers. Representatives from all corners of the world were therefore very interested in the campaign, and information material was very popular. A main topic for the ILC this year was a push for gender equality, and this is also a relevant issue for wellbeing in the workplace. Vision Zero will surely be back again at the ILC next year.